Sam Poppleton is the founder and conductor of The Zeitgeist Chamber Orchestra. He is also apprentice conductor to the Orchestra of St John’s Smith Square, a lay-clerk at Southwark St George's Cathedral and choirmaster to All Saint's Fulham's Junior All Saints Singers and Fulham Prep School's award winning chamber choir,. Sam graduated from Oxford University with a First Class degree in Music in 2013, having studied at The Queen’s College where he also held the Maurice Pearton Choral Scholarship. Whilst at Queen’s, Sam held the conductorship of Oxford University Student Chorus with whom he performed termly concerts in the Sheldonian Theatre. 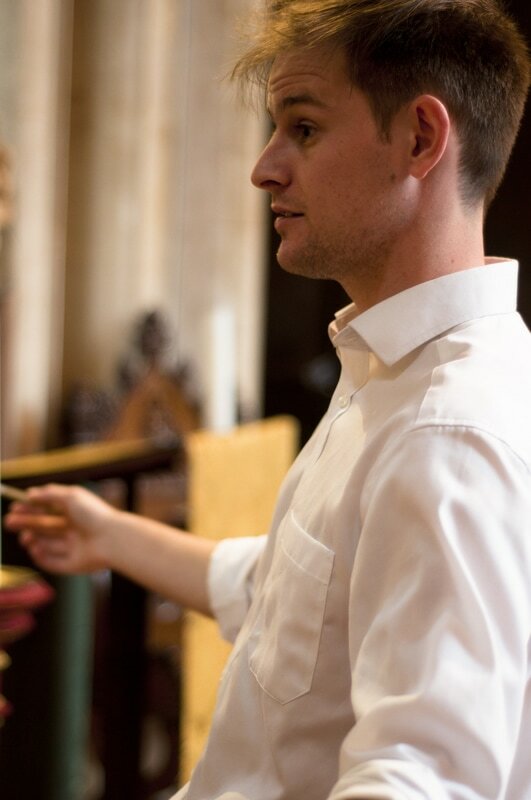 Sam has since continued working with choirs and conducted Kensington Brass’s performance of Purcell’s Funeral Sentences for the Death of Queen Mary and Jongen’s Messe en l'honneur du Saint-Sacrement. During his final year Sam was asked to stand in and conduct Beethoven’s Symphony No.8 for Oxford University Orchestra. Since graduating, Sam has sung as a lay clerk at Magdalen College, Oxford, conducted The Orchestra of Saint John with Paul Archibald as soloist in the Ashmolean Proms in Ives’ The Unanswered Question, served as Assistant Conductor to the Amadeus Orchestra, including working on the Elgar Cello Concerto with Raphael Wallfisch, and has regularly rehearsed the Salisbury Symphony Orchestra. Recent performances include with Salisbury Sinfonia, King's Colllege London's production of Hansel und Gretel and debuting new commissions by Peirs Kennedy and Tim Fisher. Sam has taken part in masterclasses with the Dubrovnik Philharmonic Orchestra, Nicholas Cleobury, Peter Stark and Achim Holub and is continuing his conducting studies with Colin Metters. Sam enjoys a rich and varied musical diet aside from conducting. He has completed an MMus in Musicology and Composition at KCL, sung with the Aurora Orchestra as part of the Oxford Lieder Festival, played trumpet at Montreux Jazz festival, contributed vocal arrangements for the Oscar winning score to the 2012 Les Miserables film, and dressed up as a tiger while working on Music Makers Summer Courses.